Established in 1996, The Olympia Eye and Laser Centre is fully equipped to diagnose and treat the most challenging of eye disorders including corrective surgical procedures. Dr. Joffe’s consultative approach includes complete medical work-ups and thorough patient diagnostics, relying heavily on the accuracy of tests conducted by very specialized equipment. Ultimately, results are digitally collated at a central point by the ophthalmologist. 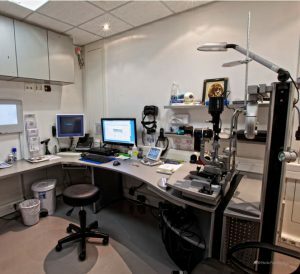 The sophisticated nature of the medical services offered at The Olympia Eye and Laser Centre drives the requirement for continual technology upgrades in support of their critical equipment and processes. As technology improves in the ophthalmological field, so does the scope of the medical solutions at the Centre. There’s commitment at The Olympia Eye and Laser Centre to embrace the latest medical advances and to acquire the latest technology in support of these advances. Likewise their IP (Internet Protocol) infrastructure needs to complement these advances. The biggest challenge faced by the installer, Cabling Solutions, was to ensure that interruptions to this busy practice were kept to a minimum while upgrades were implemented. Providing a guarantee that the operating theatre was always available and ready for use, whether for scheduled procedures or for emergencies, was a top priority. There was also a need for a reliable, resilient, high performance network system to support the continuously advancing and evolving nature of the practice. “The practice is a dynamic one and excellence is the only acceptable outcome,“ says Mr. Louis Meyer of Cabling Solutions, “things either get done properly or they do not get done at all and the chosen network cabling solution must be able to accommodate these highly specialized demands,” he adds. In addition to its core business, the Centre’s security, administration and telephony functions are also supported by the IP infrastructure, making a totally integrated system another key deliverable for this installation. The chosen infrastructure solution must accommodate all of these IP-enabled systems. The implementation of new medical devices along with smart building solutions maintains the Centre’s elite status. EoIP is the cornerstone of their sophisticated technology platform. the location of the consolidation frame to the output position. Come expansion time, the practice will be fully geared in terms of cabling already in place. “The planning for future growth has always been crucial because our equipment includes a state-of-the-art excimer laser and we are soon to add a femtosecond laser within the next 12 months,” says Dr. Joffe. “In addition to this, we are currently expanding the practice to include a dedicated eye laser theatre and the network foundation simply must accommodate that growth,” he comments. in this recent project. The DB Space commitment to local stock and quality service goes a long way to supporting customer requirements on this critical project. “At the outset when we were planning for the installation of high-end medical devices, I researched the Molex solutions. Today I am confident that these solutions, along with the services provided by the certified installer, support my vision of providing a leading, cutting edge surgery Centre that is able to adapt to new innovations in my field,” says Dr Jonathan Joffe.